Manager Malky Mackay wants fans to create a "fortress" at Cardiff City as they face promotion rivals Blackpool. Blackpool wrecked Cardiff's Premier League dream in 2010 with a 3-2 defeat in the Championship final, and are hotly tipped to be promoted again this season. "Blackpool are seen by most people as favourites for the division," said Mackay. He urged fans to spur Cardiff on as they face a test against the Seasiders. Cardiff last defeated Blackpool with a 2-0 home win in October 2008, with three 1-1 draws last season and in 2009/10. Mackay recognises the threat they pose at the Cardiff City stadium on Saturday. "They've got two years worth of parachute payments as well, which is in the region of £30 million." Cardiff, with a significant investment of their own by their Malaysian backers, are being viewed as genuine contenders to gain automatic promotion. Both clubs are on 13 points after the first seven games of the season. Blackpool ended eight-game winless run in regular league games against Cardiff, with 3-1 victory at Cardiff City Stadium on 4 February. Each club has won 10 of the 33 league matches staged on Cardiff turf. But the Bluebirds will be looking to get their Championship campaign back on track after they crashed to a 3-2 defeat to Crystal Palace at Selhurst Park last weekend. The Welsh side gave away two penalties and their manager admitted his side were their own worst enemy, making too many self-enforced mistakes at critical times in London. Mackay also admits he fears a Blackpool backlash after Ian Holloway's side suffered a 3-1 defeat at home to newly-promoted Huddersfield. "It will be a very tough game as Blackpool will be coming off the back of a defeat to Huddersfield, and looking to bounce back," said Mackay. I've no doubt in the threat that they pose, that's why they're everyone's favourites. They're a tough team that has attacking threats and can score from anywhere." The Bluebirds are looking for their fourth straight home win of the season when they face Blackpool on Saturday, and their manager thinks the fans can help them achieve that. "We desperately want to turn Cardiff City Stadium into a fortress," said Mackay. "We want to make it a place to which teams don't want to come and listen to the noise of our fans spurring us on. We've had fantastic support from our fans since day one. "When they see the effort from their team then they will support us until the last minute." 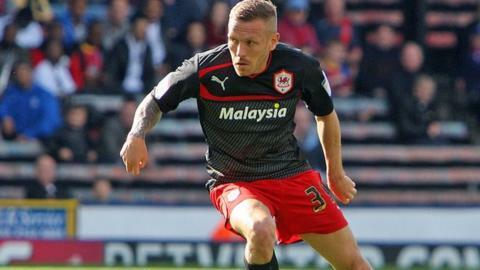 Wales' Craig Bellamy is in the squad to face Blackpool, along with wing Craig Noone, but the Bluebirds have a foot injury worry over midfielder Jordon Mutch.